With more women than men enrolled in U.S. colleges, Americans might assume the education of girls and women isn’t an issue. But that’s not the case around the world, as more than half the young children out of school around the world are girls. 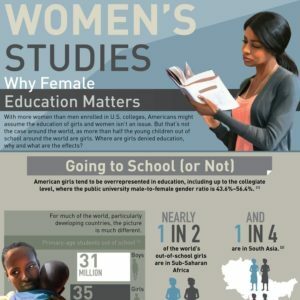 Where are females denied education, why and what are the effects? For much of the world, particularly developing countries, the picture is much different. Why Aren’t Girls in School? Beyond the morality issues, educating women can help boost the economic future of struggling countries. Educated women will participate more in the labor force and, in turn, contribute to the GDP. Children of educated mothers (especially daughters) are more likely to go to school and have higher levels of educational attainment.